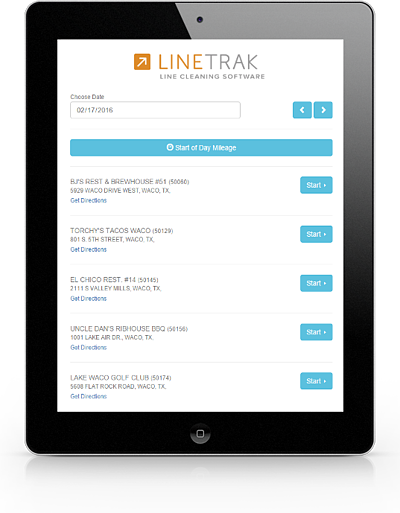 Eliminate the "Paper Trail", Increase Compliance, and Get Real-Time Cleaning Data With LineTrak®! LineTrak™ consists of an app and software that tracks verification of draught system cleaning compliance; provides line cleaning assignments and scheduling with GPS tracking and customer acknowledgement; and provides general survey capabilities and tracking. Craft Brewers Conference Special - Our Lowest Price Ever! LineTrak provides verification of draught system cleaning so you can be confident that you consistently serve great-tasting beer. LineTrak replaces paper-based systems, providing visibility of established cleaning schedules and activities, including customer acknowledgment. Line cleaners use their smartphone or tablet - instead of paper - to record cleaning transactions and integrated GPS services pinpoint the location of the line cleaner, insuring that the retailer is actually visited. 1.) The "Paper Trail" - Current paper-based methods of reporting on cleaning activities lead to stacks of documents that have to be sorted, logged and filed. This adds hours of unnecessary administrative work (and cost). With LineTrak, all completed cleanings are logged electronically and are immediately available for viewing. Digital reports can be run with the click of a mouse so you can easily see what was done - and when. 2.) Missed Visits - Regular cleaning is vital to successful draft beer sales. Missed visits affect the taste of your products and the confidence of your customers. LineTrak's mobile app lays out each day's schedule for your cleaning team and allows them to easily spot any missed visits. At the end of each day, digital reports can be generated to show any missed visits that day so they can be quickly rectified. 3.) High Costs - System inefficiencies raise costs. The scheduling, routing, executing and tracking of cleanings must be done in the most efficient manner possible. By managing all of these functions "in the cloud", you lower your costs and increase overall productivity. LineTrak allows your team to work "smarter not harder". Costs come down as a result.